The discovery of causal relationships from purely observational data is a fundamental problem in science. The most elementary form of such a causal discovery problem is to decide whether X causes Y or, alternatively, Y causes X, given joint observations of two variables X, Y . This was often considered to be impossible. 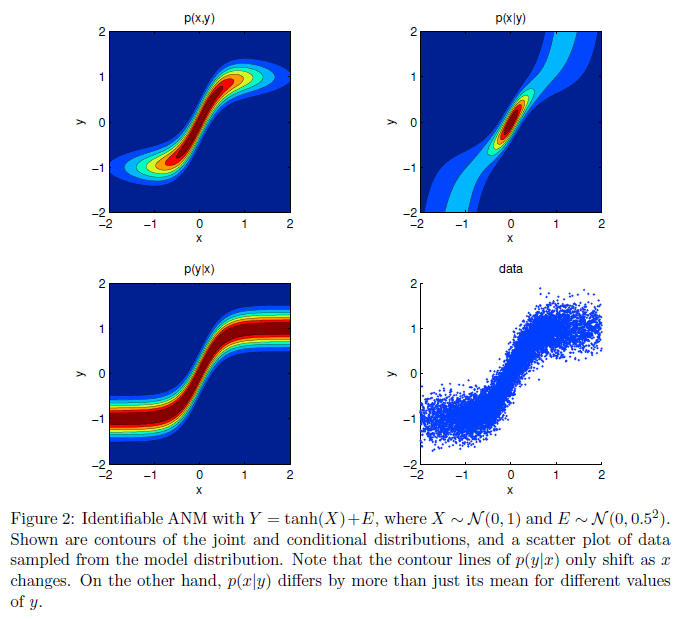 Nevertheless, several approaches for addressing this bivariate causal discovery problem were proposed recently. In this paper, we present the benchmark data set CauseEffectPairs that consists of 88 different "cause-effect pairs" selected from 31 datasets from various domains. We evaluated the performance of several bivariate causal discovery methods on these real-world benchmark data and on artificially simulated data. Our empirical results provide evidence that additive-noise methods are indeed able to distinguish cause from effect using only purely observational data. In addition, we prove consistency of the additive-noise method proposed by Hoyer et al. (2009). The basis of the new approach is to assume that the relationship between X and Y is not symmetrical. In particular, they say that in any set of measurements there will always be noise from various cause. The key assumption is that the pattern of noise in the cause will be different to the pattern of noise in the effect. That’s because any noise in X can have an influence on Y but not vice versa. There's been a lot of research in stats on "causal discovery" techniques, and the paper in essence is running a horse race between Additive-Noise Methods and Information Geometric Causal Inference, with ANM winning out. Some nice overview slides providing background are here.